Wyatt, Dimple, Eva and Maryn are all at a crossroads. To have a baby or to not have a baby. Wyatt is a single man who is tired of waiting for Mrs. Right to come along and start a family. His heart has been broken enough times, and he is ready to adopt a child of his own. But very few adoption agencies will give a “single father” the time of day, and his quest to become a father is twisted into something perverse by many members of the public. But Wyatt won’t back down when all he wants is to become a father. Why do men and women get treated differently when parenthood comes into play? Dimple is an actress slowly inching past her prime, and she, like Wyatt, feels the urge to have a baby of her own. But her agent and many in the acting business believe that this decision would be career suicide. Is she willing to give up Hollywood to become a mother? She has been waiting for the right guy to come along and now she’s starting to wonder if a man is really necessary-beyond the initial contribution, of course. Eva is a Hollywood agent representing a hot young starlet who wants to take over Hollywood, and she has just met and begun seeing the man of her dreams. But Eva has a secret that she fears will mean the end of her perfect relationship. Eva doesn’t want kids. Not now, not ever. Will she wind up alone? Maryn is in the horse shipping business, highly successful and a cancer survivor. Before she began cancer treatment, she and her husband had embryos frozen in the event that her ovaries were rendered useless by the process. Divorced before her cancer was even in remission, Maryn now wants to use those embryos. Her ex-husband and his young new wife aren’t so keen on the idea, however, and she finds herself in a court battle of epic proportions and a media circus that becomes a national issue. Are frozen embryos people? Should they be destroyed when the couple no longer has use for them? Should people be allowed to access unwanted emryos and use them for their own fertility issues? Having a baby has never been so complicated-and all four characters are about to find themselves twisted into a complicated web as paths cross and relationships form between the most unlikely of people. This book will be particularly interesting for women who have reached or surpassed child-bearing years and faced that question themselves: To be a parent, to not be a parent… And what is YOUR definition of family? 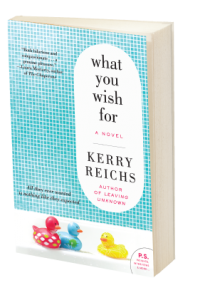 Kerry Reichs has also written Leaving Unknown, The Good Luck Girl, and The Best Day of Someone Else’s Life. If you like Chicklit, you will want to try her out!